A new translation of selections of Ptolemy's Almagest for a Ptolemy reader. The book includes notes to assist a nonspecialist readership. Designed as a text for use in courses, it contains extensive introductions to the celestial phenomena and to Ptolemy's world system, as well as preliminaries to the individual books of the Almagest. The selection includes Ptolemy's presentation of the form of the universe, the mathematical tools necessary to construct planetary theories, and the theories of the sun, Venus, Mars, together with an account of retrograde motion and the procedure for computing planetary positions for any date. This selection constitutes a lucid introduction to Ptolemy's extraordinarily powerful constructions and his amazingly sophisticated mathematical methods. Joe Sachs has followed up his success with his translation of Aristotle's Physics with a new translation of Metaphysics. Sachs's translation brings distinguished new light onto this Aristotle's work, which is foundational to history of science, opening up Aristotle's original thought to readers by using Aristotle's everyday language rather than abstract Latinate words which distort his meaning. 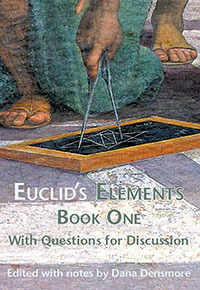 A handy where-to-find-it pocket reference companion to Euclid's Elements, this has all of Euclid's propositions and diagrams without the proofs. A combined edition of Conics Books I-III and Conics Book IV, previously available only as separate volumes. This is the only available English translation of the Greek text for these four books. We have taken the classic Heath translation, given it a completely new layout with plenty of space and generous margins, and published it in an affordable but sturdy student edition in one volume, with minimal notes. Green Lion Press offers this monumental work in a handsome facsimile reprint of the three-volume first edition. Howard Fisher guides the reader through Faraday's Experimental Researches in Electricity, displaying Faraday's experimental virtuosity and keen theoretical insight. Fisher's thoughtful selections and clear, helpful explanations of the instrumentation and elecromagnetic phenomena make this fascinating text accessible to those who lack time to find their way through the labyrinths of the original. Faraday is also among the most accessible of writers, recounting his researches not in the abstract symbols of analytic mathematics but in vivid, lucid, English prose. In this volume, Faraday boldly explores a new relation between magnetism and electricity. As we follow his narrative we can both witness and participate in his thinking, his questioning, and his insights. In this incisive work, Thomas Simpson shows that not only is a literary reading of James Clerk Maxwell's Treatise on Electricity and Magnetism possible, but that such a reading brings us closer to Maxwell's underlying thought, revealing purposes that reach far beyond the equations of electromagnetism. Green Lion Press is delighted to issue as a fine volume Simpson's classic work, which has been circulating underground for decades as photocopied typescript. It is the first major study of Maxwell's Treatise to take seriously the way Maxwell's presents his arguments. This is the original full treatment, to which Simpson's Figures of Thought provides an enticing introduction. Maxwell's Treatise on Electricity and Magnetism brought about what Einstein called "the greatest change in the axiomatic basis of physics since Newton." But Maxwell's aim was never to construct an axiomatic theory. Instead, the Treatise presents an argument which, beginning with the most characteristic electrical and magnetic phenomena, and interpreting them as manifestations of continuous fields of electric and magnetic energy, culminates in Maxwell's theory of light as a wave motion within those fields. The argument of the Treatise is not straightforwardly demonstrative but is a dialectical one that can be challenging to discern among the many topics presented. This book undertakes to extract and expound the principal path of Maxwell's dialectical thinking. Notre Dame professor Michael Crowe follows up his deservedly popular Theories of the World from Antiquity to the Copernican Revolution and Modern Theories of the Universe from Herschel to Hubble with a guided sourcebook on motion and its causes. The book presents substantial selections from the writings of Galileo, Newton, and Einstein, with additional selections from Aristotle, Oresme, Descartes, and Huygens. The book has extensive commentary aimed at guiding nonspecialist readers through the texts. At the same time, Crowe gives a "hands-on" account of the growth of mathematical physics, using only very simple algebra to re-state the less accessible earlier mathematics. Mechanics from Aristotle to Einstein is thus both a vivid introduction to the history of mechanics and a textbook in elementary mechanics. In these pages, we meet Isaac Newton, James Clerk Maxwell, and Karl Marx as we have never seen them before, as champions of a scientific vision that leads to intellectual freedom and human emancipation. We see Newton, the last of the alchemists, creating a visionary physics that was intended as a direct refutation of the dead mechanism of Cartesian philosophy. We see Maxwell striving to free the human intellect from the dogmatism of the "Newtonian" physics of his day, the champion of a new democratic science as exemplified by the work of Michael Faraday, a largely unschooled commoner. We are astonished to meet Marx, the ultimate libertarian, envisioning "a society in which the full and free development of every individual forms the ruling principle," a society that could be attained through a rational understanding deliberately constructed to emulate Newton's approach to physics. Around the turn of the eighteenth century, one of the most pressing practical scientific problems was accurate prediction of the moon's position. Although Isaac Newton had hoped to solve this problem using the dynamic approach developed in Principia in 1687, he never succeeded in doing so. Instead, he reverted to an old-fashioned kinematic theory, using epicyclic motion. A terse summary of the theory was published in 1702 by David Gregory as part of his Astronomiae elementa. The present work includes Newton's full text of Theory of the Moon's Motion with annotations explaining terms and relating the text to Kollerstrom's analysis. In this detailed study, Kollerstrom solves the enigma of Newton's "forgotten" lunar theory. He ascertains, for the first time ever, just what Newton's theory did and did not achieve. This guidebook by Dana Densmore with translations and diagrams by William H. Donahue makes the great adventure of Principia available not only to modern scholars of history of science but also to nonspecialist undergraduate students of humanities. It moves carefully from Newton's definitions and axioms, through the essential propositions, as Newton himself identified them, to the establishment of universal gravitation and elliptical orbits. Now in its third edition, the guidebook presents Newton's original text (the selections newly translated for this edition), offers notes and questions for pondering, and then expands Newton's sketched proofs step by step. Following his original proofs exactly eliminates the common confusions and misinterpretations of what Newton assumed and what he proved in the course of the development of his great work. We continue Joe Sachs's new translations of Aristotle with On the Soul, a work that contains not only Aristotle's treatment of the psyche but also his theory of light and color. Again, Sachs's fresh and jargon-free approach cuts through presuppositions and prejudices that are associated with the idea of "soul." Includes Aristotle's work On Memory and Recollection. The first complete translation of Kepler's Ad Vitellionem paralipomena, quibus astronomiae pars optica traditur (1604) by William H. Donahue, the translator of Kepler's New Astronomy. The Optics began as an attempt to give astronomical optics a solid foundation and soon transcended this narrow goal to become a complete reconstruction of the theory of light, the physiology of vision, and the mathematics of refraction. The substantial passages provided in this edition allow one to enjoy the precision and clarity of Darwin’s writing and the patient thoroughness of his reasoning. Step by step, layer by layer, detail by detail, like the most intricate detective story, he constructs his case. An annotated translation of selections from Kepler's greatest work. Much of the book is nontechnical in nature, discussing gravity, the earth's motion (in relation to both physics and scriptural interpretation), and the physical aspects of the planets' motions. An excellent, brief introduction to Kepler's thought. Newton’s new conception of the laws of the universe challenged centuries of received opinion and laid a new foundation for our “common sense” understanding of the physical world. If you have always wanted to know more about Newton’s achievement but thought it was the exclusive province of experts, this little book will guide you through the essentials of Newton’s argument in his own words and using only elementary mathematics.